Combine lemon juice, honey, vinegar, salt and pepper, stirring with a whisk. Gradually drizzle in olive oil, stirring constantly, until vinaigrette is mixed thoroughly and doesn’t separate. 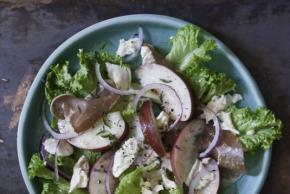 Combine lettuce and peach wedges in a large bowl, drizzle with dressing and toss to coat. Arrange salad on serving dish or in individual bowls and top with prosciutto, red onion and mozzarella cheese. Top with freshly cracked black pepper.